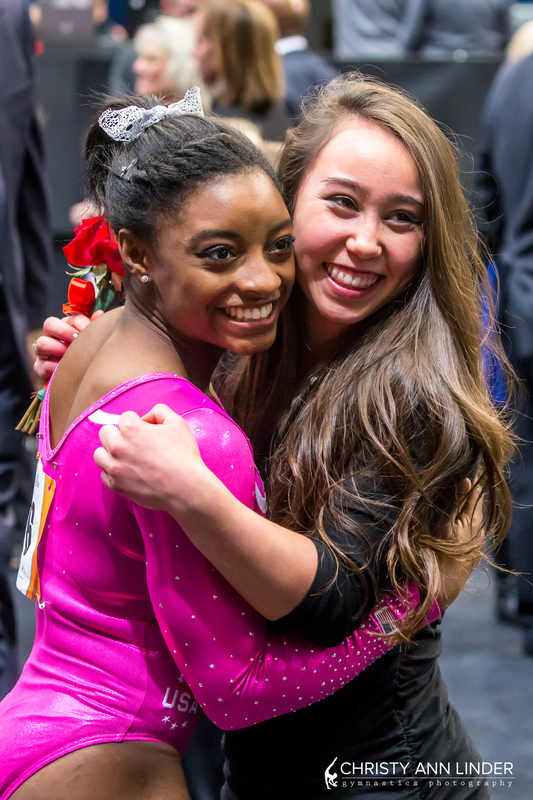 Simone Biles hugs Katelyn Ohashi after winning the 2015 American Cup. Marta was on the Nastia Cup broadcast doing commentary again and it was fantastic! Oleg gave Uncle Tim the best birthday present ever! MyKayla Skinner crashed her Cheng in podium training and completely missed her hand. (see photo gallery link below). The top seven all-around placers at World Championships are invited. If that includes the host country already, the 8th placer is invited. If it doesn’t include the host, the 8th spot is reserved for the host. The FIG Executive Committee can invited a 9th wildcard. If after inviting the top eight they don’t have eight participants, they then invite placers nine through twelve from Worlds. If they still don’t have eight, they then invite each federation in the order they finished in the team competition at World’s (up to the eighth place team) to send a gymnast until they get eight. Then the wildcard gymnast is selected by FIG. Do we think it’s fair the way NBC characterizes Simone as unbeatable, as if the pressure doesn’t compound exponentially the more she wins? Debate our favorite moments and best saves of the meet: MyKayla Skinner on beam or perhaps Sam Mikulak on high bar. We give our thoughts on leveraging the host country’s music and cultural dances in floor routines. We pretend we are Aimee Boorman and devise a strategy to keep Simone Biles happy, healthy and engaged. We pretend to be Sam Mikulak and devise a plan for him to convert the consistency he had for his NCAA team to his elite career. The High Bar tension controversy: are the men supposed to all use the same tension on the high bar? No, we are asking. We want to know! Nastia Liukin gets her first grade from us as a commentator. Friday the 13th of NCAA Gymnastics. Every meet had a terrifying crash. The worst of which was Shelby Hilton from University of Kentucky. We have an update on her and opine that perhaps a little angel named Kylie had something to do with that crash. The Rage-o-Meter ; Trautwig needs to acknowledge that the majority of the gymnasts on the World Cup circuit are in their 20’s and that’s the new norm. And many women in their 20’s make the US Olympic team and even win medals. Ellie Black’s balance beam landing positions. Unreal. Ellie Black (CAN) layout landing position on balance beam. I just wanted to say neuroblasmo isn\’t a brain cancer. Though it has the word neuro in it it\’s typically found in the kidneys. I like be your show by the way. Nothing against that it just drives me insane when people say incorrect things about childhood cancer. The diagnosis wasn\’t neuroblastoma, though — Shelby was diagnosed with medulloblastoma, which is a form of brain cancer. Actually, you are both wrong. Neuroblastoma is a cancer of the neuroendocrine system, most often starting in the adrenal glands but it also originates in other areas of the body. It isn’t a cancer of the kidneys. It drives me nuts when people don’t understand this killer of children. Great show again guys! 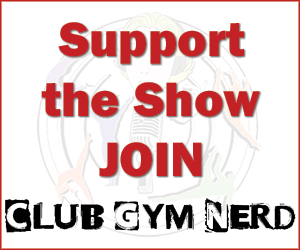 Love how your brought in Mez to the show to talk about her gymnasts friends. (P.S. tell Mez she should come to a training camp with Ellie at Alta!) Now with all my love for Simone and how amazing her form is in the air in her tumbling, that floor was a little overscored. Here are some easy to see deductions. That alone is 1.0 so a 15.8 score, with other deductions to take. She should still be the clear winner of every title ever on floor. Every other event was about far even if the wobbles on beam. Jessica – I love your love for Ellie and her beam, but can you believe that the judges at the American Cup gave her layout on beam a D-value!!! So she lost 0.2 in her SV for the connection and E value part!!! I think you are incorrect in your statement that Simone could have received a .5 deduction for a hop back. The code of points lists only a .1 or .3 deduction for a step/hop back. – I am so done with Al Tautwig. Every time he opens his mouth I fantasize about him getting put out to pasture. I bet he’d stand around the in the pasture talking about how the grass is green . – I swear with Nastia designing leotards and giving gymnasts swarovski crystal manicures, she’s channeling Oprah. I bet she tells the gymnasts how to live their best life ever and encouraging them to create vision boards. – Jingoistic music. It doesn’t seem to work at all for foreigners but seems to work if you’re representing your home country. I’m thinking Moceaneu doing Devil went down the Georgia (honestly the Atlanta was predisposed to love her but she had them eating out of her hand with that routine) and Cheng Fei’s Yellow River Concerto where again the crowd lost their damn minds. (I went back and watched that routine, oh man the relief and joy in her face when she finishes the routine is incredible. He’s being saying stupid stuff since he started (1998). My favorite: In the 1998 nationals (his first time commentating on gymnastics) he says something about Kristen Maloney’s start value and goes something like “it’s a relatively new thing” (referring to the start value). *sigh* so while I get the issues with him, it’s nothing new. He’s not saying stuff about the meets for gym fans like us. He’s saying it (even if he’s wrong, he is really only reading what NBC tells him) for the fans who only catch the meets randomly or are four year fans. Personally I wish they’d get rid of him and replace him with John. Yes, for sure. He’s only doing his job. But we do enjoy a good cathartic rant. John Roethlisberger would be hilarious! He’s great at playing the fool and making the non-gym fan laugh. Kathy Johnson or Bart would be awesome too. Jess, I’m right there with you with your hatred of Al Trautwig. I’ve never understood why he is still a commentator for NBC. They got rid of Elfi, but not him?!? Elfi may have been annoying sometimes, but at least she was a former gymnast that actually knew about the sport. Al is just some rando who knows nothing about the sport, despite broadcasting for it the last 15+ years. He’s the WORST, and he someone manages to get worse every freaking year. I’m convinced he has some dirt on someone up in the ranks at NBC to still have this job. Literally anyone would be better than him at this point. Another thing related to the NBC broadcast, could they please get rid of their stupid stop light scoring meter already?!? They’ve been using this to explain the scores for at least 5 years. I think anyone who’s watching any gymnastics broadcast at this point either understands the scoring system, or can figure it out on their own if they care to. If you insist on using it, mention it once and be done with it. Al constantly has to bring it up throughout the entire broadcast, and it makes me want to punch him even more than I normally do. Ugh! Enough ranting, great podcast as always!! Can’t wait for the next one!